Following the NZ blockchain conference in Auckland, there was an impromptu blockchain meetup in May the week after and for very good reason. 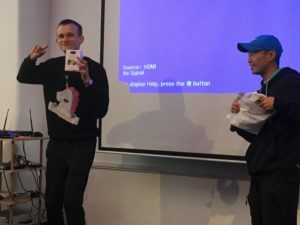 Vitalik Buterin was in town and this was a chance not to be missed. He spent a long weekend in Wellington and on Monday the 15th, many people from Wellington, especially those who couldn’t make it to the conference got the chance to hear him speak and ask questions. His talk was a little less technical than the same one he presented in Auckland and the audience was full of 80% new faces, many of which were wearing suits. Vitalik spoke for about 25 minutes but spent an astonishing 30 mins answering questions from the audience. Never in a million years would I have thought that the creator of Ethereum would ever be at our meetup but it happened. On behalf of the Wellington crypto community I managed to give him a parting gift before his departure. Some feijoa chocolate and a t-shirt with “Wellington Ethereum Meetup 2017” printed on the back. 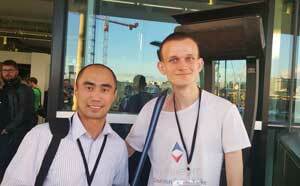 After the talk, Vitalik departed for the airport on his way to another country. India this time. 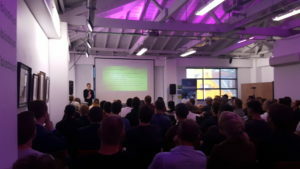 It was amazing to have Vitalik in Wellington. Thank you for coming and thanks to Mark Pascall for actually making it happen!